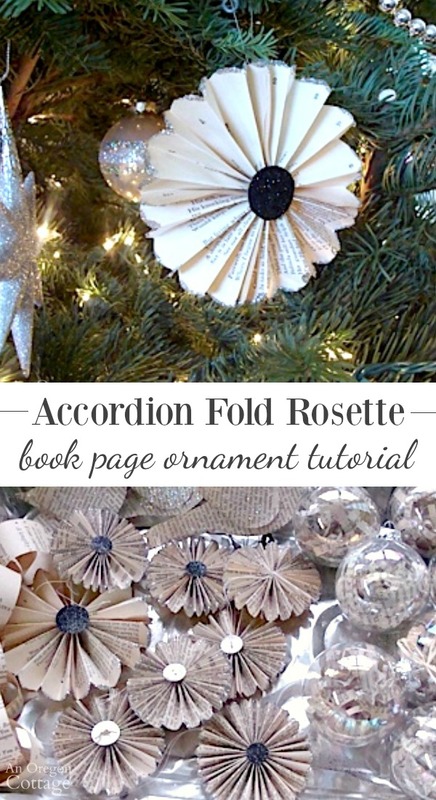 Step by step tutorial to make an easy accordion-fold rosette book page ornament with optional glitter accents from vintage book pages. One of the traditions my daughter and I enjoy is making a new handmade ornament the weekend after Thanksgiving (my son joined us when he was younger…). We’ve filled balls, cut out paper and added glitter to shiny orbs. A few years ago we decided on a vintage book page and sheet music Christmas decor theme after I made a wreath out of vintage sheet music. 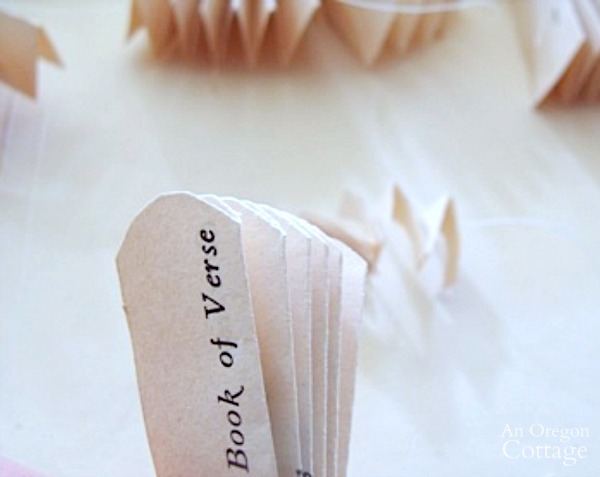 We made simple ring chain garland from book pages, clear balls filled with strips of sheet music and book pages, sweet little glittered book page birds and accordion-fold rosettes in all sizes. 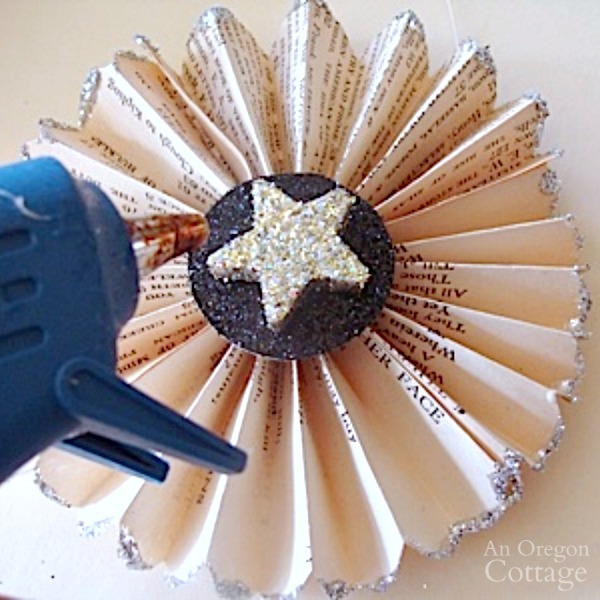 I like them all, but my favorite is probably this rosette book page ornament – they look as good on the tree as they do hanging from windows, mirrors, or leaning against candles. 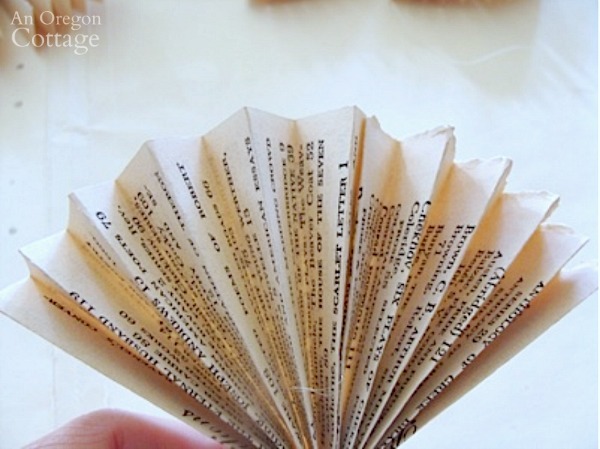 You definitely get a lot of bang for your buck with Christmas ornaments made from vintage book pages. Some old books (many of which you can get free), a glue gun, a bit of white glue, some glitter, and some paper scraps or buttons for the center. 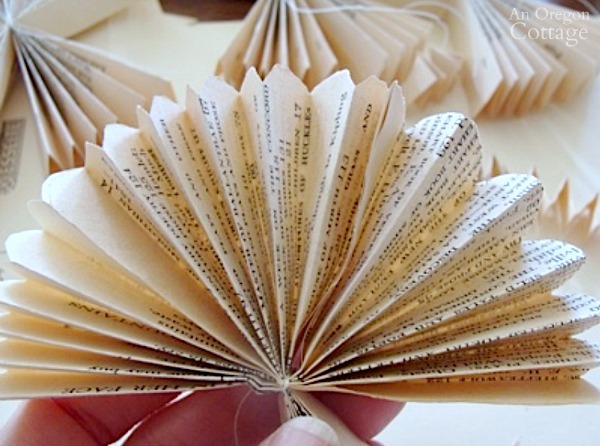 Note on using old books: some people have told me that they would never cut up any book and they are sad that I have. Of course each of us should do what we feel comfortable with in this area. From my perspective, there have been a lot of terrible books printed and just because they were printed doesn’t mean they are good. Also, you can find old textbooks that have completely outdated information and will never be read or used again. And do we need to talk about all those Reader’s Digest compilation books with just excerpts from other books? These are the books I’ve used for our Christmas book page ornaments, most of which would simply be disposed of after not selling at thrift stores. 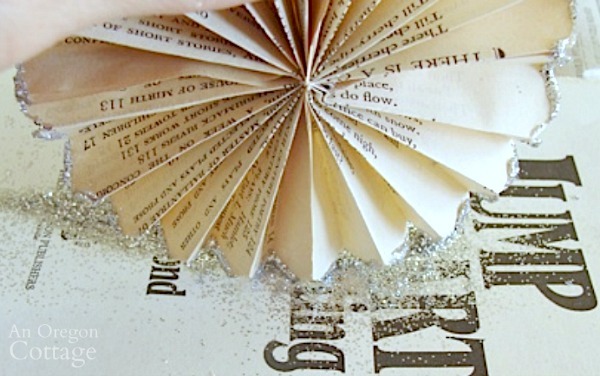 So, grab your old, not worthy books, scissors and glue and make a rosette book page ornament with me. And you don’t need a lot of time, either – just 5 to 10 minuites, tops. 1. 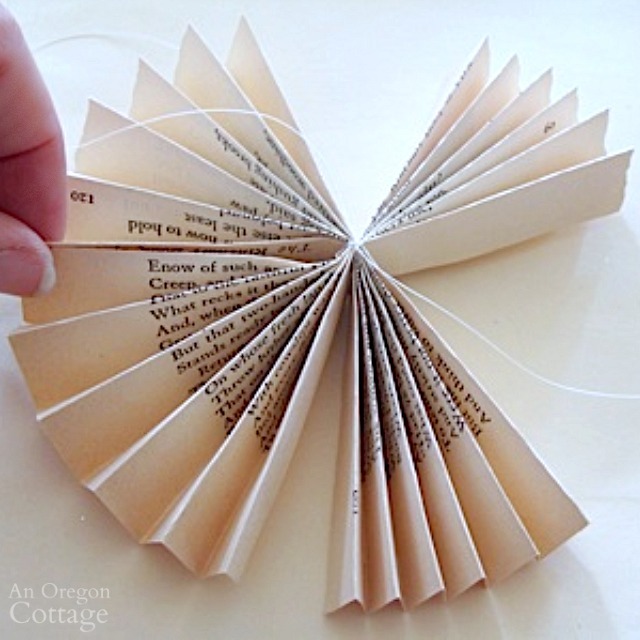 Pick a book that has pages as big as you’d like your finished rosette. 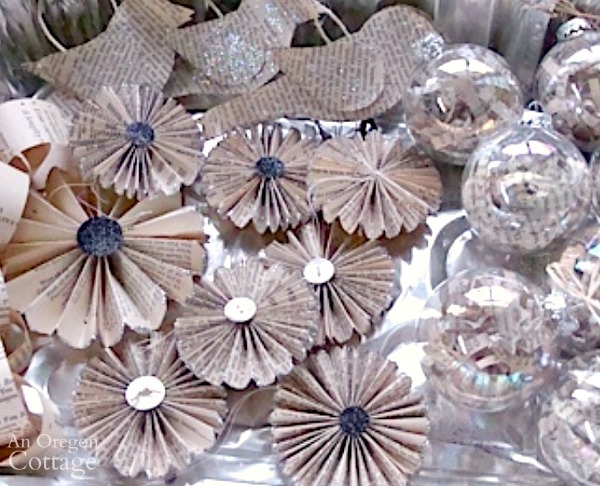 I wanted these on the tree so I used a small novel from the 1950s. I used large pages as window hanging rosettes and medium sized pages for the mantle. 2. 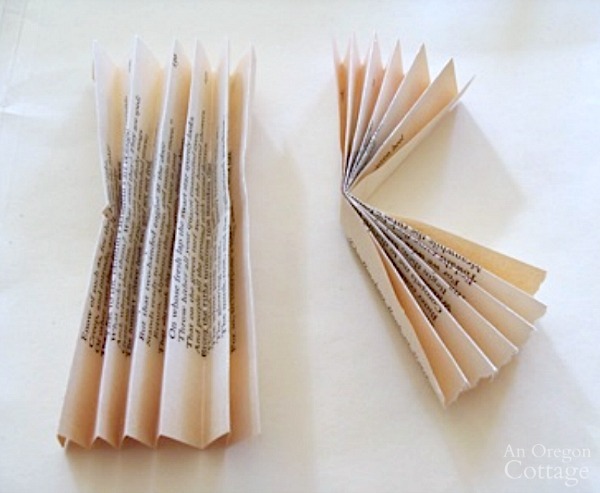 Tear out one page and cut it in half. 3. Accordion-fold each half and then fold in half (as pictured above) to mark the centers of each. 4. Use a long piece of white thread to tie the two halves together at the fold points and knot securely. I left the tails of the thread to use for the hanger, though it would be easy to punch a small hole and use narrow ribbon. I didn’t want to have noticeable hangers, so the thread was perfect. 5. Hot glue two sides of the fans together, but leave two sides unglued for now (in the photo above, I’m holding one of the sides together as the glue dries- do that with the other side and proceed to trimming the edges before gluing the last sides). 6. You can leave the edges of the rosette straight like this (above) just as they came out of the book. OR you can hold the fan together and round the tops with scissors. I think the edges look much nicer with a more finished look to them that gives the rosette more detail and definition. 7. 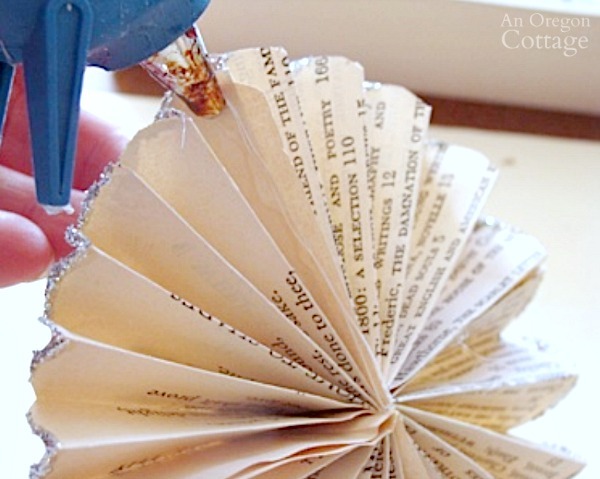 Once both sides are trimmed, glue the remaining two sides together with hot glue, creating the finished rosette. 8. Optional glitter edges: pour some white glue onto a surface (I used an old lid from the recycling bin) and roll the edges of the rosette in the glue. Then roll the glued edges in a little pile of glitter. My daughter and I were making a bunch, so we set them aside to dry at this point. They’re really not that wet, so you could immediately finish them up with the following steps before letting them dry if you’re only doing one or two. 9. 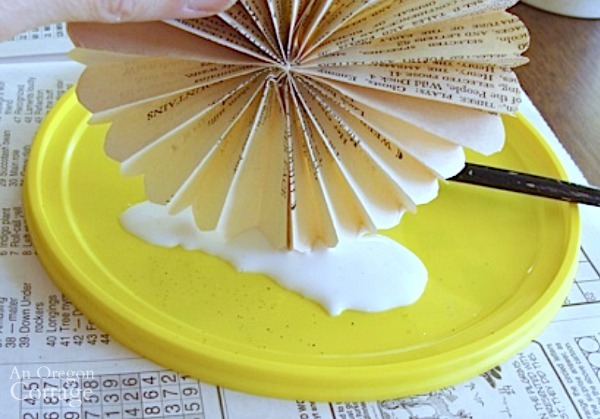 Add the finishing touch by gluing a decoration on the center. In the photo I’m using a circle I cut out from a sheet of glitter scrapbook paper, topped with a glittered star (for the window ornaments where both sides would be seen, I glued the same decoration to both sides). I also used shell buttons for the centers of some and plain black, glittered scrapbook paper circles for others. This is where you could get creative and layer different colors of papers, or coordinate with a colored-glittered edge. I wanted to leave them neutral and play off the colors in the book pages themselves, so I kept it pretty simple. 10. Finally, glue the long thread kept from the center up one of the fans on the back. 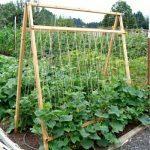 When it dries, tie the ends together to form a hanger. It would be fairly simple to punch a small hole in the top of one of the fans and thread gold or silver cording (or another color) through as a hanger as well. It all depends on the look you are going for. 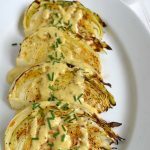 I hope you get a few minutes to make these this season- they also look beautiful adorning wrapped boxes and gift bags. 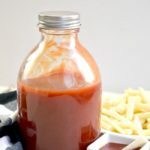 I’d love to hear if you’ve made these and how you’ve used them! Yay! It’s the holidays! 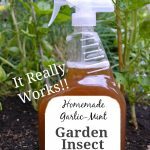 I’ve been waiting all year to try this project after I saw it last year on your blog. So cute! 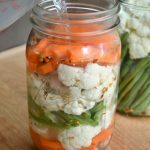 I haven’t gotten to it yet, but I was thinking — you might want to link this up to our linky party we have going on — inspiration for the season! Or if you have other posts, we are encouraging people to link up to three posts. Let me know!